AVDIIVKA, Ukraine -- Oleksandr and Ruslan drove their dusty grey minibus across a field pock-marked with shell craters, venturing into the no-man's land of Ukraine's volatile frontline. Repairmen risk lives to bring light on Ukraine frontline. Part of a team from a local factory, they can often be found risking life and limb in the east Ukraine conflict zone to repair damage to power lines that regularly plunges their hometown Avdiivka into darkness. 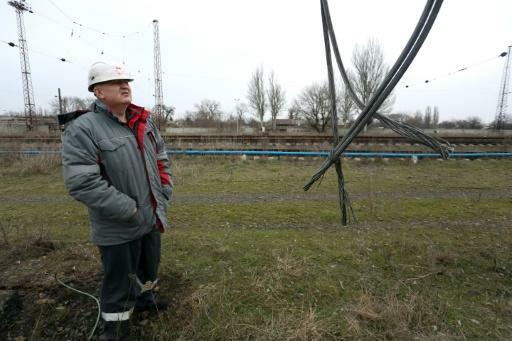 "When I see the flash of shelling in the direction of Avdiivka, I begin to count off the seconds before an outage," 45-year-old Ruslan Kolesov, the transport director at the town's coking coal plant told AFP. "I can determine where the shell fell with an accuracy of 200 metres (yards) only by the length of time and the noise." The government-held town of Avdiivka and the factory where Kolesov works regularly get caught up in shelling between Ukrainian forces and the Russian-backed rebels on the other side. Four power lines, vital for both operations at the factory and lighting the town, run across the frontline from thermal power plants located in rebel-held territory. That means that cables often get cut by the fighting and the repairmen have to tool up. "The plant is the heart of the city. It provides light and heating to all residents of Avdiivka. If they interrupt the supply of electricity to the plant then the entire city is without light," Kolesov explained. Before the search team can even reach the power lines, Kolesov and his colleagues have to go through the fraught process of getting the agreement of both Ukraine's military and the rebels to hold fire. "We start only when both sides give us a 'green corridor'. But even if both sides promise it, it does not mean that we will not come under fire," he said. In 2015 members of the team were detained as saboteurs at one of the insurgent's checkpoints before being blindfolded and taken for questioning after their phones were seized. The men were eventually released after a few tense hours when militants learned who they were. The team was recently given kevlar helmets and body armour by the Ukrainian army but they are often reluctant to wear the gear -- preferring their old white plastic helmets and overalls for fear of appearing like combatants. "When we wear khaki-coloured bulletproof vests, it's hard to explain that we are not saboteurs," said 37-year-old driver Oleksandr Korovan. Some of the team insisted they are now inured to the danger as Ukraine's low-level war wears on towards a third year, having cost more than 10,000 lives already. But Korovan and another driver still draw lots to decide who will take the wheel for each risky mission. "One counts only on intuition in our work," Korovan, a father of two children, said. "Every time it is scary." The men do not get any extra money for the risks they run but insist they have no plans to quit their jobs all the same. "Our city and our factory are like a big anthill," said the other driver Sergey. "They are trying to destroy our anthill with shellings, but we, like ants, fix it all together, bring back the light, and it lives again."